The carhauler.com had a this very interesting picture of a car hauler that seemed to make it halfway inside of a box truck. The driver of the transporter is a friends brother. 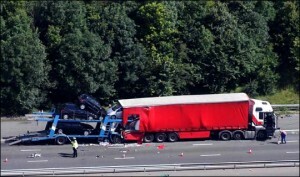 The accident happened at the junction of the M6/M1/A14 near Rugby in the U.K. The junction was designed back in the 1960s and isnt suitable for the speed and volume of modern traffic. Its an accident blackspot because lane 1 of the M6 can be full of stationary traffic queing to leave the M6 and join the A14. 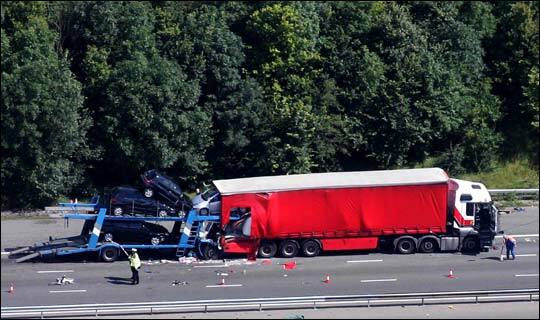 Cars and trucks can become trapped in lane 2 and slam on the brakes to try to get into lane 1, which is full of stationary vehicles, and this can cause rear end shunts. I believe this is what happened here. I dont know about other parts of the world but in the U.K the motorways can be very congested and its next to impossible to achieve a decent gap between you and the vehicle infront. Once you create a gap, someone moves into it. My friends brother was seriously hurt, having crush injuries and being “scalped” by the windscreen. He was trapped and had to be cut free by firefighters. Fortunately he survived and I think has made a full recovery. He very nearly bled to death in his cab and for a while he was touch and go. The driver of the other truck was uninjured. This entry was posted in Auto Transport and tagged accident, oops, wrecks. Bookmark the permalink. Although there is no cause listed, I’ve seen how MANY transport drivers in the UK and on the Continent tailgate each other. Both for simply being way to aggressive and also to keep the four wheelers from weaving.